Take a moment to consider how many pieces of content you might see in a day. Do you scroll through your social media mindlessly at the start of your day? Do you have a favorite blog you check in the afternoon? The average adult spends up to twelve hours and seven minutes each day consuming media of some kind. Now, consider how much of that content has truly impacted your life. When was the last time a social media post inspired you to share it with your friends? Have you read a blog that made you think about an opinion you hold? If you’ve ever experienced this phenomenon known as connection, you know how truly potent valuable content is. As a business owner, you should strive to create content that does the exact same thing for your audience. So how do you create content that connects in this way? The answer lies in value. Your customers see so much content every day. How much? Well, according to the American Marketing Association in 2017, consumers see up to 10,000 brand messages a day! You must do your best to stand out from the rest. The best way is through providing the highest quality content possible. This means making copy customized to fit your brand and the needs of your audience, as well as to focus on quality over quantity. The bottom line: your content efforts should focus on your customer, not your business. Focus on adding value to your customer’s life. The truth is, a blog doesn’t always have to educate. Although educational content is great content, sometimes your audience is craving just a bit more. How about we entertain, enlighten and expand? There’s nothing like curling up with a good book and a blanket. For some of us, reading is a little home away from home, a retreat throughout the day. Have you ever thought that your content could be the same? 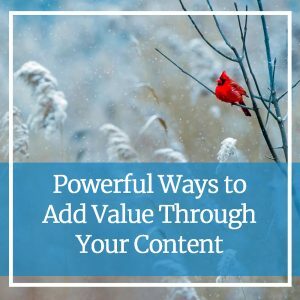 Content that adds value will often make the reader laugh out loud or shed a tear out of inspiration. Do you watch your favorite movie for the educational value? If it’s your favorite, you already know all there is to know. You simply watch it for pure entertainment and what it does for your wellbeing. Allow your audience to feel the same way about your content. Try it by showing your witty side or telling a personal story to bring your audience closer to you. With myriad content out there, chances are your subject has been covered before. The task at hand isn’t to necessarily find a topic that hasn’t been done before, but to take a topic and do more. To enlighten someone means to open their eyes to greater knowledge, even if it’s something they already know. Try enlightening your audience by being authentic and personal as you pen your thoughts. Share a quote. Take the topic to the next level and speak to the future. Take a simple topic and make it in-depth using facts, statistics, stories, definitions and more. The sky is the limit here. Buzz Lightyear said it best: “to infinity and beyond.” As a business owner, you may strive to go above and beyond for your customers as an act of customer service. Your content should be treated no differently. Use your content marketing efforts to go above and beyond, answering your audience’s questions or concerns about your topic, adding in resources, step-by-step instructions and more. Don’t be afraid to give it all away. Your sales won’t diminish as you give away the information you have. In fact, it will do just the opposite. The value you offer will only build greater trust with your audience, thereby increasing their likelihood to buy. Words Are Powerful. But They Can Also Be Hard. The words you use are powerful—they can make or break your brand and your sales. But, hey, we get it. Words are hard. The trick is to just get started. If you find you need help creating powerful copy, we’re here. Want to ask a question about writing valuable copy or want a fresh take on the copy on your website or blog? Send us a message!